When your state and your Congressional district are being targeted by both major political parties and several special interest groups, the days leading up to Election Day are fast-paced as national groups and speakers come to Arizona. Nov. 1 is a big day for political events. Tucsonans Talk Back to McSally & Trump Jr.
As Donald Trump Jr. stumps for Congresswoman Martha McSally in Maricopa County, Tucsonans will be protesting in front of her office on Broadway Blvd. Organized by Arizona Healthcare Voters, the purpose of the rally is to call out McSally’s lies about her votes on the Affordable Care Act and on healthcare in general. Media advisory here. As the ranking member of the Arizona House Health Committee, I am happy to be participating in this event hosted by Arizona Healthcare Voters. The US has the most expensive and least effective healthcare insurance system when compared to other developed countries. McSally and the Republican Party want to make our already overly complicated and expensive system even more restricted and more expensive. That is going in the wrong direction. Come on down and tell McSally what you think of her record on healthcare, health insurance, the Affordable Care Act, Medicare, Medicaid, and more. The organizers’ Facebook event is here. To gear up for Nov. 6 and for the 54th Session of the Arizona Legislature, the Equal Means Equal Equality Tour is stopping in Tucson on Nov. 1 and in Tempe in Nov. 3. The directors of the movie “Equal Means Equal,” Kamala Lopez and Natalie White, will be in town for the event. Come on down for a full evening of entertainment– dotted with a few speeches. I will be one of the speakers, along with LD9 Senate candidate Victoria Steele. We had a great crowd of about 50 people who came out for the Tanque Verde Democrats LD9 Forum on May 12. For those of you who couldn’t make it, my husband Jim manned me video camera, and we taped the whole thing. There are seven videos total. 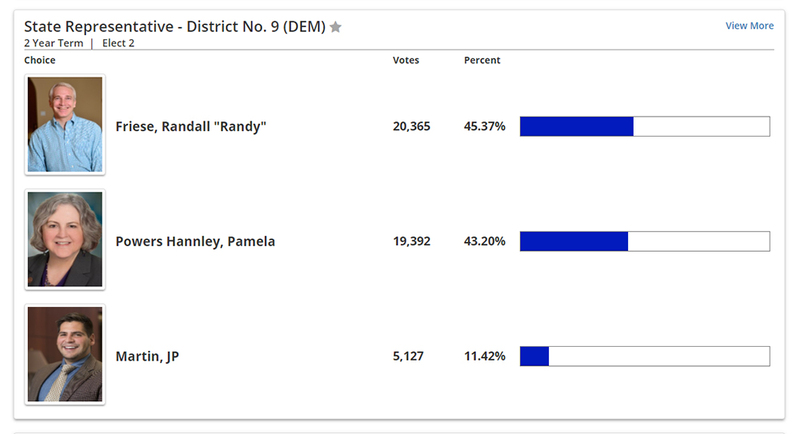 Each incumbent or candidate answered every question, and each question is a separate video. The video topics are: introductory comments, water policy, the property tax hike for TUSD residents, gun violence prevention, police interactions with communities of color, working across the aisle, and closing comments with accomplishments or goals. You can watch the forum videos, as well as my one-minute updates and selected Arizona House Floor Videos on my YouTube Channel here. (There is also a link to subscribe if you want to follow me on YouTube.) Below the fold are the videos from the meeting. If you are wondering what that red cone is in several of the videos, it is a flag on an audience member’s wheelchair. At first when I saw the raw video footage, I thought, “Who was wearing a tiny red party hat?” Check out the videos after the jump. My September update to constituents featured my Legislative Report card, which I expanded on in this blog post. Since September was so full of events, I decided to publish the update in two parts. This is the fun part– the photo album of events. 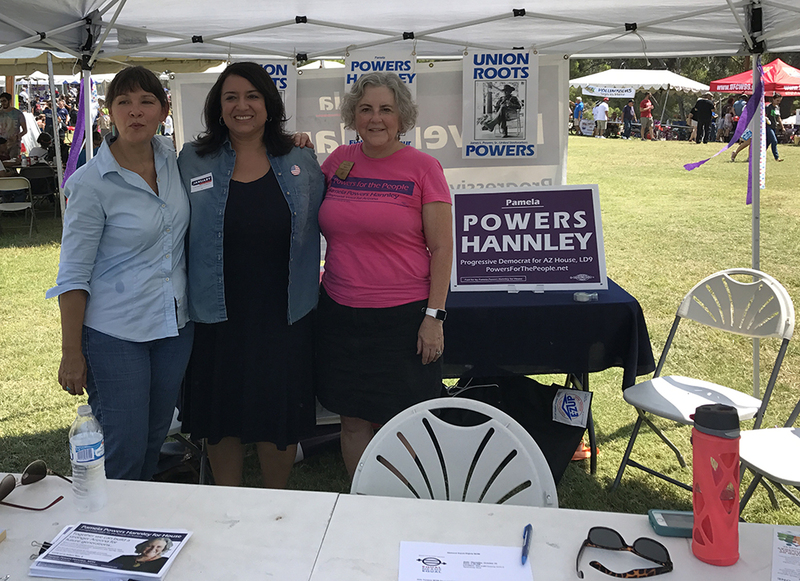 Women candidates, activists, and electeds were everywhere on Labor Day. 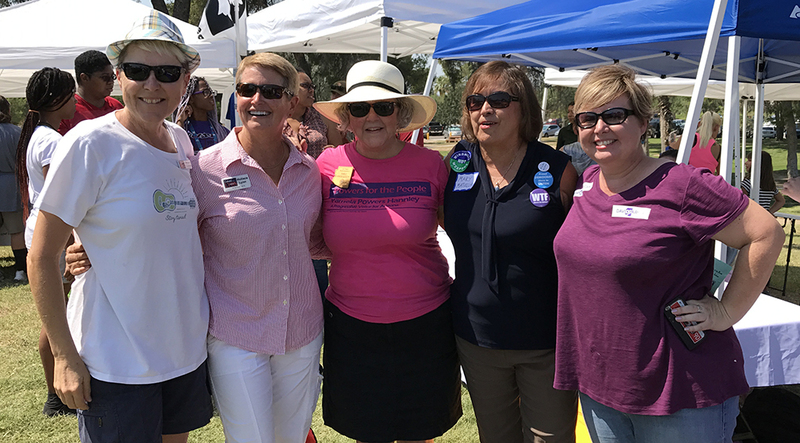 Left to right we have: Linda Lyon (Blog for Arizona blogger and education activist), LD11 House candidate Holly Lyon, me, CD2 candidate Mary Matiella, and TUSD board member Kristal Foster. My shady tent was very popular. Here I am with LD9 Senate candidate Victoria Steele and Attorney General candidate and Emerge Sister January Contreras. Meet the Women who want to change Arizona. I am honored to participate in the Tanque Verde Democrats’ Women Candidates’ Day Forum. What a great lineup– Ann Kirkpatrick, Victoria Steele, the LD10 Arizona House candidates and me. The TV Dems are a great group. They meet at Risky Business on Saturday morning for coffee, light breakfast, and politics. Stop by and meet the women who want to change Arizona! Facebook event here.